Monarch Air Group provides private air charter in Jersey City, NJ. Our clients benefit from top-notch service, unrelenting dedication to safety, wide selection of aircraft, and years of experience in chartering private jets. To obtain a free quote, please use our online quoting tool provided below, or call toll free 1-877-281-3051. Monarch Air Group provides private jet charter flights in and out of Jersey City, New Jersey, USA. Jersey City is an industrial city in northeastern New Jersey, on the Hudson River, opposite New York City. 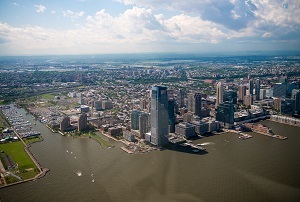 With a population of about 247,597 people, Jersey City is the 2nd most populous city in New Jersey. A total area of the city is 21.080 square miles. The most notable points of interest include Liberty State Park, Statue Cruises, Easyriders Jersey City, Liberty Science Center, The Murder Mystery Company, Calypso Sailing Adventures, and some others. The nearest airports are Newark Liberty International Airport (EWR / KEWR), which is located 8 miles from the city, LaGuardia Airport (LGA / KLGA), which is located 16 miles from Jersey City, John F. Kennedy International Airport (JFK / KJFK), which is located 25 miles from the city, and Westchester County Airport (HPN / KHPN), which is situated 43 miles from Jersey City. 1. ARX, Asbury Park, Neptune, NJ, United States. 2. AYZ, Zahns, Amityville, United States. 4. BLM, Monmouth Executive Airport, Belmar – Farmingdale, United States. 10. DYL, Doylestown, Doylestown, United States. 11. ESP, Birchwood-Pocono, East Stroudsburg, United States. 12. EWR, Newark Liberty International, Newark, United States. 14. FRG, Republic Field, Farmingdale, United States. 15. HPN, Westchester County Apt, White Plains, United States. 16. ISP, Long Island Mac Arthur, Islip, NY, United States. 17. JFK, John F Kennedy Intl, New York, United States. 18. JHC, Island Heliport, Garden City, United States. 19. JRA, West 30th St Heliport, New York, United States. 20. JRB, Downtown Manhattan H/p, New York, NY, United States. 1. Sheraton Lincoln Harbor Hotel, 500 Harbor Boulevard, Weehawken. 2. Ramada, 442 Mercer Street, Jersey City. 3. The Doubletree by Hilton Hotel and Suites Jersey City, 455 Washington Boulevard, Jersey City. 4. Sheraton Lincoln Harbor Hotel, 500 Harbor Boulevard, Weehawken. 5. The Ritz-Carlton New York, Battery Park, 2 West Street, New York. 6. Candlewood Suites Jersey City, 21 Second Street, Jersey City. 7. Ramada, 442 Mercer Street, Jersey City. 8. The Doubletree by Hilton Hotel and Suites Jersey City, 455 Washington Boulevard, Jersey City. 9. Sheraton Lincoln Harbor Hotel, 500 Harbor Boulevard, Weehawken. 10. Candlewood Suites Jersey City, 21 Second Street, Jersey City.